Faith, Hope and Ivy June is a pleasant addition to Lovelace nominees. It is the story of Ivy June Mosley and Catherine Combs, two 7th Grade girls in Kentucky from very different socio-economic backgrounds who visit the other in her home for two weeks each as part of a school student exchange program. The book stays true to this nice, but predictable, theme and formula. Ivy June lives in Thunder Creek with her grandparents (her own house became to crowded with the addition of a fifth child) where her family struggles for money, work blue collar jobs in mines and factories and are without indoor plumbing and telephone service. Catherine lives in upper-middle-class Lexington where her father owns the printing company his father owned before him, her family of five shares four bathrooms, computers and cell phones abound and she attends the private school her mother did as a girl. The voices of both Ivy June and Catherine are beleiveable until the last couple chapters. Near the end of the narrative while Catherine is staying with Ivy June and her family she receives word that her mother has a serious medical condition. Just days after that, Ivy June’s grandfather is involved in a serious mining accident. The inclusion of the mining incident in particular on the heels of Catherine’s experience is contrived and not particularly well done. The irony is that the mining complication is unnecessary. Naylor does a good job of threading Ivy June’s constant dread regarding her grandfather’s safety and her spikes of terror when she hears a siren or overhears a snippet from the TV news about anyone being “trapped” anywhere. Ivy June’s ongoing fear for her grandfather’s safety is a much better counterpart to Catherine’s fear over her mother’s condition than the mining accident. Thank you for everything. If we wrote a story about this, no one would believe it all happened in the same week, would they? is ridiculous and disappointing. It changes Catherine’s voice, breaking both her character and Ivy June’s. It is obvious the author is: (a) admitting she has forced elements into the narrative to further her plot; and (b) desperately asking the reader to buy into it. There are no surprises as the story unfolds. In the end, both girls learn to appreciate more fully the lives they have and value the experience of participating in and becoming aware of a lifestyle different from her own. It is a fast, easy read that, although predictable, is nicely paced and satisfyingly fulfilled (with the minor exception mentioned above). It will appeal more to female readers choosing a Lovelace nominee to read. 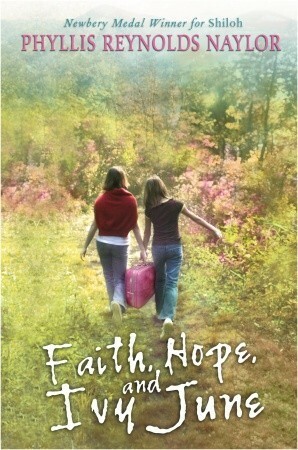 Those who do choose to read Faith, Hope and Ivy June may not be excited about it but will probably enjoy the story and be satisfied with their selection.